I have never been a gamer in the traditional sense of the word. Of course I had a Nintendo and I admit to playing Parsec on the TI-99 (that was a computer not a calculator). But I have never really been into games like many people. But I did play games in school. Specifically I spent a lot of time on Oregon Trail and LOGO. And I loved them. I know for a fact that time spent on “games” like those had a major impact on my love for technology and certainly increased my knowledge and skills in other areas. It is certainly true that games have their place in schools. Few people out there would argue that fact. After all computer based games have been used in schools since the personal computer was invented and games in general have been used in school since the beginning of time. There are the drill and kill basic games that help us remember multiplication facts or the Period Table of the Elements. There are even some more advanced games that involve some kind of reward and a bit more competition. But please allow me to make a distinction here. The use of games in school is one thing. True gamification is another. As a director of technology I always like to use the business world as an example so here goes. Look at the number of apps and websites that gamify everyday things. There is the OKDOTHIS app which allows users to “challenge” each other to create new photographs. It’s a fun app, and I personally love the idea that people can challenge each other with the latest “DO of the Day”. We can find another example in the once-popular 0boxer.com tool. The idea was that you got badges/awards for getting your inbox numbers down. I tried it back in the day and it was just plain addictive. I actually found myself deleting messages that I may have genuinely needed, just for the rewards! And don’t even get me started on the gamification of fitness. Robert Appino has a great post about some of the popular apps that could be models for schools. My contention here is that the games, the plain old games, will always have their place in schools, but the gamification of learning has massive untapped potential. Imagine if your history class was nothing but a huge immersive game. You’d have to carefully construct the reward system and be aware of the benefits and pitfalls of serious competition in your classroom, but I think the risk may pay off. My first exposure to immersive games was probably when I was about 10 years old when I learned to play Myst. This game takes the player to a foreign world where there is not just one thing to do or just one goal. Basically the user is immersed in a world where they can do anything virtually. Today some of these games have taken the form of MMORPG and other immersive fiction games. The type of immersive games I am interested in exploring are those that involve the whole class over an extended period of time. I’ve seen a few examples of this like The Dragon Collective that are immersive games where the entire class is involved. In The Dragon Collective students are learning Chinese while at the same time being immersed in a game that keeps them motivated. Students collect clues, solve riddles, etc. This idea reminds me of the Assassin game. I have always loved the immersive nature of this game and would love to see how teachers could use a similar technique to involve kids in learning via immersive game play. These games’ value lies in the fact they they are so engrossing. Using this type of game in education could be as powerful as language immersion is for language learners. The idea behind language immersion is that when a student is surrounded by the language and many times the culture, they will learn by osmosis. What do you think the potential is of immersive games in the classroom? Is anyone trying something like this? Hit the comments section and let me know. Update: Has anyone seen the immersive game of “Classcraft“? In my research for this post I have stumbled upon this site. It’s an online game designed to be used in the classroom all year with all your kids involved. I love this concept and would like to investigate further! I have taught the concept of SAMR to teachers for years. We’re like old friends. But if I was honest I’d have to say SAMR and I have had a few fights and attempted to make up over the years. I think many educators are misunderstanding the stages of SAMR. One particular PD session I helped with years ago made this clear. We asked teachers to read educational scenarios and decide where they fit in the model. Some scenarios were simple to figure out but many of them were tough to slot into “S” “A” “M” or “R”. When we reviewed the “answers” teachers pushed back, giving great reasons why certain scenarios fit in various categories. “Do they just not understand?” I wondered, or was the model broken? I’ve seen blog posts over the years that reinforce these wonderings. Excellent, well-meaning educators have blogged about SAMR, some even with examples of work that fits in the four different levels. But at times they seem to be saying conflicting things. Have a look at this article published in Edutopia where they tout shared Google Slides as “Redefinition” Wow. If that is Redefinition then I am left feeling like there is nowhere else to go. But have I, among many others that do things like share presentations online, really maxed out on the SAMR scale? Reid Wilson has a new take on this and I’ll have to say, I am in total agreement with his article and I could not have said better myself. Wilson, I believe, is saying that the SAMR model limits us by steering us to think about the tools. The higher level, he calls it conceptualization, is another space above redefinition that allows for people to not just put the same old technology together in new innovative ways, but rather to think of things at a whole new level. We can conceptualize things. It’s beyond putting things together. It’s conceiving of ideas and it has a much higher ceiling than redefinition. I chose the above image because its creator added this element that shows progress over time and I like this new dimension in the SAMR. Take a look at the line. Once we get into the “Redefinition” area we enter the “Slope of Enlightenment” but notice it is just a slope. This diagram is begging for a new level but I am cautious about suggesting one. I almost want to leave the model behind and talk about this new “conceptualization” idea of Wilson’s, separate from the SAMR model. It leaves the troubles of the model behind and takes to to a new place where we can stop talking about tools and what we do with them and start talking about ideas and concepts. 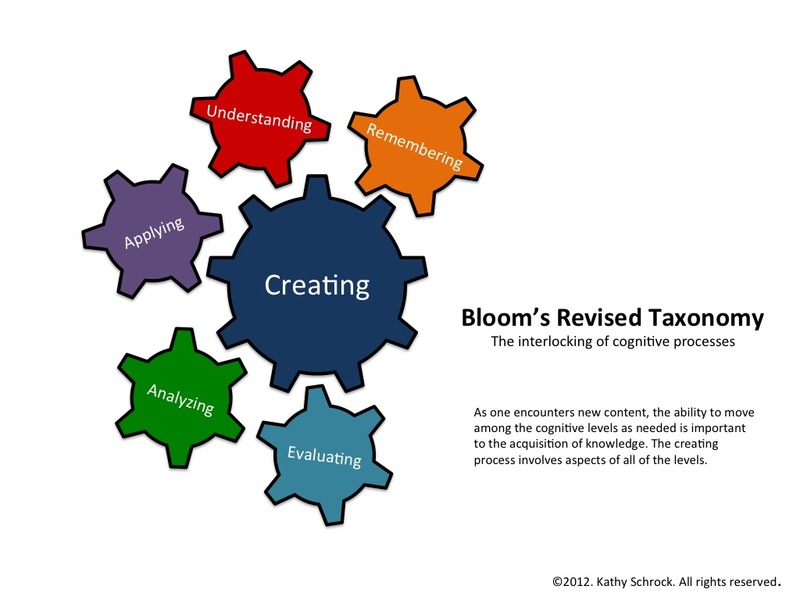 Actually I like this concept of a revised Blooms’s taxonomy from Kathy Schrock of all the parts working together. There is no hierarchy, no top or bottom. All the processes work together like a machine. My goal is to push my teachers to the next level or to an entirely new place if it is not a level. Will you join me in this healthy challenge of the SAMR model? Will you join me in liberating teachers from the idea that they must figure out new ways to “do technology” in order to climb to the top of the SAMR model? Disclaimer: Like Reid I don’t claim to be an expert on this subject and certainly not even close to Puentedura himself. I am just a heavy user with quite a bit of hands-on experience working with teachers and talking about this model. Side note: there are some very entertaining versions and modifications of the SAMR model out there, many inspired by iPad apps. Check this one out. May I make a general plea to the ed tech world? Please don’t create any more of these iPad app charts, wheels, diagrams, etc. It’s a bit like getting a tattoo on your arm of the number one song on iTunes. It’s going to be out of date by the time it’s done!